On Tuesday, Shinsuke Nakamura finally debuted to a friendly post-WrestleMania SmackDown crowd in Orlando, accompanied by an electric violin and a raucous reception. Nakamura is one of the most popular wrestlers in NXT history, and was probably ready for the main roster the moment he stepped in the door of developmental last year. In addition to being the most charismatic wrestler on the roster, Nakamura is also one of the company’s best workers, as is evidenced by his roughly 15-year career filled with classic matches and iconic moments. 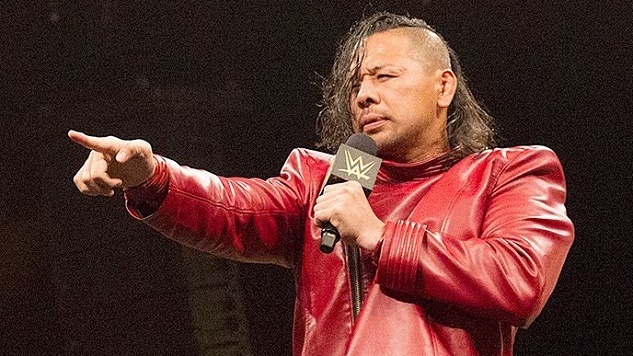 Below, we ranked Shinsuke Nakamura’s 10 greatest matches. The finals of the 2014 New Japan Cup featured Nakamura against Bad Luck Fale, with the winner getting to choose whether to challenge for the IWGP Heavyweight Championship or the Intercontinental Championship. This was Fale’s biggest match of his career up to that point, but many fans felt he had no real shot at beating the well-established superstar—until Nakamura’s head was busted open. After a botched armbar attempt from the King of Strong Style, the 6-foot-4-inch, more than 300-pound Fale came crashing down and inadvertently headbutted Nakamura, instantly causing him to bleed profusely. The visual of a bloodied and battered Nakamura now made him the underdog, but after a devastating Boma Ye to Fale, Nakamura emerged victorious. At King of Pro-Wrestling 2013, Shinsuke Nakamura faced the vice president of rival promotion Pro Wrestling NOAH. Naomichi Marufuji is known for innovating several popular wrestling maneuvers, and for being NOAH’s first junior to transition to the heavyweight class after defeating Mitsuhara Misawa Jun Akiyama for the GHC Heavyweight Championship. On his return to New Japan, Marufuji set out to beat Nakamura and take his title to NOAH. Nakamura already lost the title to a CMLL competitor earlier that year, and couldn’t afford to let it go to another promotion again. After failed attempts to knock the champion out with roundhouse kicks, Nakamura defeated the challenger, and kept the title home in New Japan. In 2013, Shinsuke Nakamura was embroiled in a rivalry with one of CMLL’s biggest stars, La Sombra (now wrestling in NXT as Andrade “Cien” Almas.) The feud spanned two continents, and their final match at Kizuna Road was payback for Nakamura, after losing his Intercontinental Championship to Sombra during a CMLL show in Arena Mexico. He’d spent years building up that title as one of the most prestigious in Japan, and In a match that featured Japanese strong style and traditional lucha libre, Nakamura accomplished what he set out to do by taking the belt back to Japan. This match saw Nakamura occasionally step out of his comfort zone with maneuvers more commonplace in lucha matches, which helped set this apart from the average King of Strong Style bout. With any hope, a rematch is in the cards, now that they’re both in WWE. Shinsuke Nakamura’s WWE debut required very little build up. On an episode of NXT, William Regal announced that Nakamura was coming to face Sami Zayn at the next Takeover event. That was it. There was no elaborate story to sell fans on Nakamura, nor any real explanation as to why this match made any sense. It didn’t matter: A first-time confrontation with two of the world’s most talented in-ring performers was the selling point. The strategy worked, as the crowd gave Nakamura a very loud welcome upon his entrance, and he went on to have one of the best matches of his career with someone he had no experience with. This was a career high point for both competitors, and a dream match many fans didn’t know they wanted until it was announced. At Wrestle Kingdom VII, Nakamura faced world-renowned mixed martial arts fighter Kazushi Sakuraba. In MMA, Sakuraba holds victories over some of the most high-profile fighters in the sport—Royce Gracie, Quintin Jackson, Ken Shamrock—and sought similar success in his return to the wrestling world when he challenged Shinsuke Nakamura for the Intercontinental Championship. Early in the match, it seemed as if Sakuraba had become the new champion, after legitimately knocking Nakamura out with a hard knee. Nakamura miraculously gained consciousness minutes later and defeated Sakuraba in a hard-hitting match that resembled a real fight. For years, Shinsuke Nakamura and Hiroshi Tanahashi were the top wrestlers in New Japan, and when they feuded over the Intercontinental Championship in 2014, their status in the company helped make that belt as important as the Heavyweight title. Nakamura originally lost the championship to Tanahashi at the main event of Wrestle Kingdom 8. Three months later, the two wrestlers would once again headline a major show with the Intercontinental belt on the line at Invasion Attack. During the match, Tanahashi focused on damaging Nakamura’s left knee, the knee he used to deliver his signature running knee strikes. But after two strikes with his right knee, Nakamura recaptured the championship. At Wrestling Kingdom 10, Shinsuke Nakamura defended his Intercontinental Championship to the leader of the Bullet Club, AJ Styles. By this time, AJ Styles had been in New Japan for close to two years, yet the two had never faced off, quite impressive considering they were key figures in rival stables and competed in two separate G1 tournaments. Seemingly, they had avoided each other by pure chance, making this showdown a big first-time matchup for not only New Japan, but the wrestling world at large. Nakamura successfully defended his championship against Styles, and the two showed each other respect after the match was over—something Bullet Club members weren’t known to do. Shortly after this match took place, it was revealed that both Nakamura and Styles would head to the WWE. With both superstars now on Smackdown, could a rematch be in the works? The G1 Climax 24 finals featured two of New Japan Pro Wrestling’s biggest box office draws against each other. Shinsuke Nakamura and Kazuchika Okada, the two top members of the CHAOS faction, had only faced off once before in 2012, before Okada became New Japan’s biggest young star. But by 2014, this was a dream match that could main event anywhere in the world. It was Okada who would prove to be the better man of the two, after unleashing three Rainmakers in a row to win the tournament. On day four of the 2013 G1 Climax Tournament, Shinsuke Nakamura was up against a newcomer to the heavyweight division: Kota Ibushi. Ibushi was considered a high flyer, and wrestled similar acrobatic junior heavyweights before switching weight classes. But Ibushi had also trained in martial arts for years, and in his first match against Nakamura, his striking talents were on full display. Nakamura mockingly shrugged off some of his opponent’s resolve in the opening minutes of the match, but as Ibushi continued to go strike for strike and hold for hold with him, the humor was gone. An angered Nakamura tried to keep Ibushi down with constant kicks to the head, despite the referee urging him to stop. The two would battle for almost 20 minutes, and Ibushi shocked the crowd by kicking out of the Boma Ye at one. A second finisher from Nakamura proved to be too much, and Ibushi finally lost, but he won Nakamura’s respect. Two years after his first encounter with Ibushi, Nakamura faced him again at New Japan’s biggest show of the year. This particular show was a turning point for New Japan, as it was the first time a show was available on live U.S. pay-per-view, with play-by-play commentary from Jim Ross. This match was the most exposure both of these wrestlers had at that point. By then, Ibushi was a comfortable and well-established star in the company. Nakamura was now facing a fully confident man, instead of an upstart with something to prove, as he did in their previous match. Now it was Ibushi occasionally shrugging off Nakamura, and mocking him with taunts. He even used Nakamura’s own signature moves against him. But the mind games were not enough to take Nakamura down, and Ibushi was defeated a second time after an instant classic. Michaelangelo Muñiz is a lifelong fan of professional wrestling, and even pretended to be a lucha libre promoter in the short film “Some Guys are Bigger than Others.” You can find him complaining about everything on Twitter @FLAMbaby.